I had 2 S-10's with that engine, both carbed. The carbs were little 1bbl pieces o'crap, but the engines just kept on ticking. Not much power, but were pretty good workhorses for me. If you never let it overheat, usually you wouldn't have head gasket issues. They weren't GM's best engine, but I've seen worse. The 4.3l (at least the one in the S-10) was a 90-degree V6, the 2.8l is part of the 60-degree V6 family....in fact I think it was the first 60-degree V6, which was still used up until a few years ago. Maybe it still is, for all I know. I've never heard anything good about the carbed motors, but the MPFI ones from 86-90 seem to be pretty good....at least, as good as any domestic V6 from that era. The 4.3l V6 on the other hand was a superb motor, I had one in a '93 Astro. Had the 2.8 in an S-10 pickup. For normal driving it was fine. For carrying a load it was fine( firewood, mulch, dirt). Not enough power for getting onto highways and getting up to speed. Mechanically wise replaced alternator once, and a/c compressor twice. Past that normal maintenence. I guess if your idea of a sport-ute is heavy on the "ute", the 2.8 is OK, nothing special, but gets the truck down the road. If you are heavy on the "sport", you won't like the 2.8, in this case if you find an otherwise satisfactory rig, if you can buy it cheaply enough, you can put in one of the crate motors that GM offers - or just keep hunting to find a rig with a more inspiring power plant. 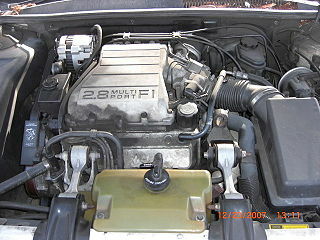 This motor was much better suited to FWD applications. There have obviously been much worse options from the factory in small pickups/SUVs, but in it's early years I don't think the 2.8 was a huge upgrade over the four banger in the S-10 series. Jeep guys loathe the carbed 2.8 that came in all XJ models until '86....a modern 3.4 makes a great swap into those trucks, though! One interesting footnote in the history of the 2.8l V6 is the LH7 High Output version. Main differences were a different cam and a 2bbl Rochester 660cfm carb...good for 135HP, which was really impressive for the early 1980s. This motor was exclusive to the X-body & A-body cars....and with the Getrag 4-speed in the Citation X-11 it was timed at 8.5 seconds 0-60 in Road & Track. Later EFI incarnations actually made slightly less power, although in the Cavalier Z24, this was still a pretty decent mill. I've driven a few of those and they're no slouch. Yeah, I remember these cars and Road & Track giving them a positive review. Well they were an improvement over what had been out there. Although. For the same budget in 1983, you could have bought say a '69 Z-28, spending as much of the budget as possible on the best example of the car you could find, fix anything that needed fixing, and had a much better car that would go up in value over the years, still had a lot of $ left over.. Better yet just have bought the best 4-speed Hemi Superbird you could find...would be well into *7* figures now. AFAIK the "early" ones had severe crankshaft problems, not enough cross section, and a buddy who worked at a Chevy store said a lot were repaired under "secret warranties". I had two of them, an '85 Chevy, fuel injected, good power, never ran it hard, lasted about 10 years, 115K miles, replaced a water pump and rebuilt the alternator. Sold it private party and saw the guy a year or so later and he still had it and liked it. 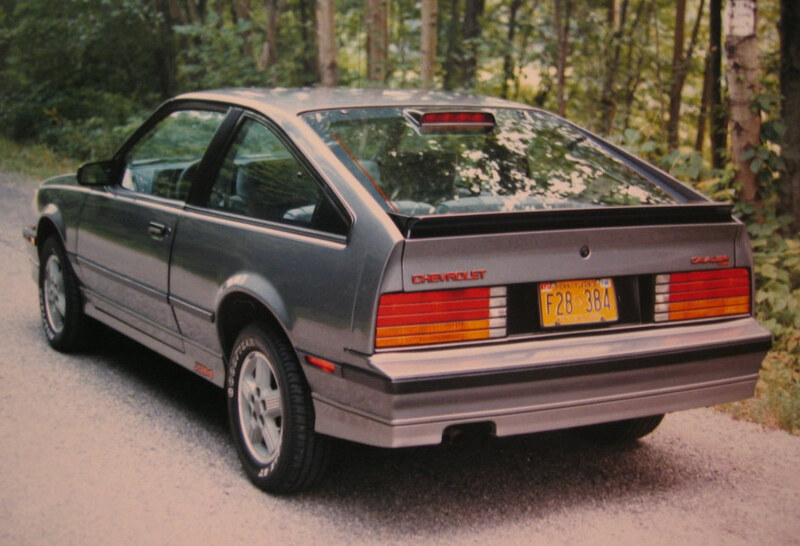 We also had an Jeep Cherokee, '84 IIRC with the 2.8, carbureted, a bit of a slug, particularly on hills. For some reason the water pump on it was always good for about 25,000 miles and the auto choke went out. It developed a bad valve seal at about 130K miles, but some "liquid treatment" elminated the smoking. Sold it at about 150K miles. I had one in a 1982 S-10 that I drove for years. I bought it with 100K on it and managed to get another 80K ir so out of it. I did have to replace a head gasket, but that was probably due to the fact that I let it overheat once. My brother bought it from me and we put in a rebuild block and 200 miles down the road, the crankshaft went bad. Weird how the original engine did not have those problems. This motor was much better suited to FWD applications. I agree, once they got the updated plenum in '87 they seemed to hold up a better. They performed well in the 88-89 Grand Prix's and Regal's. I've seen many with over 200k miles. Definitely, the early carbed motors with their wonky cranks were just a teething problem on the way to a great powerplant. When the GenII 60-degree V6 came out, GM stuck it in literally everything....and kept doing that while it improved and upgraded over the next 20+ years. I just looked it up - and believe it or not, the old 2.8 V6 is still kicking around to this day. They now call it the High Value Engine. In LZ9 spec, it displaces 3.9l and puts down a staggering 240HP with a flat torque curve (90% available from 1500-5500rpm!!). That's as much juice as the L67 3.8l Supercharged V6 was making just a few short years ago....very impressive.